Here’s the thing about stepping into a game that has had a loyal fanbase and been expanded on and built out over a period of 11 years; it becomes very difficult for new players to get into it. Especially if the people behind the game don’t make an active effort to introduce new players to it. But if those said newcomers can take the time to learn the ins and outs of the game, they may just find themselves shocked by how much they enjoy it all. Such is the situation that we have with PoxNora, a free-to-play mix of collectible card game (or trading card game, TCG, if you rather), and miniatures board game. With PoxNora you do indeed get a game that feels every year of its age; the character models are fuzzy, ugly sprites, and the environments aren’t much better. Story missions have dialogue pop ups that look like something pulled from DOS, and the really important information that you need to determine which characters and spells to use for each situation is buried in a user interface so dense that the game that is positively archaic. If PoxNora were made today, none of this would be acceptable, and I can’t see the release of it on new consoles dragging in a large new audience to the game either. So why release it on PlayStation 4 at all, I hear you ask? It’s simple. If you’re one of the few that have the patience and perseverance to give a game a real chance before moving to the next thing, you’re in for a real treat, and the more people that get the chance to experience it, the better. A couple of hours after getting to understand the various systems of PoxNora, and learning how to find the information that you need so you can make proper strategic decisions why playing the game, you’ll be mesmerised by the game’s depth. 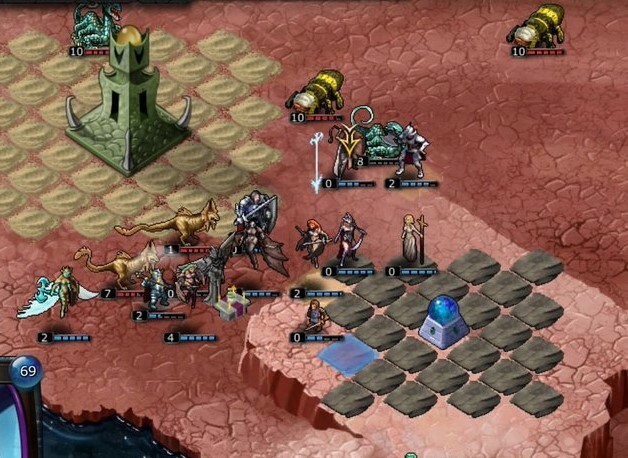 Learn how to deal with its clunky interface, and what’s left is one of the most regarding tactics strategy games that you’ll ever play. It all starts in building a deck of cards that will be used to summon the various minions onto the field of play, and cast spells to either aid ally characters or harm enemies. The goal in a game is to destroy the enemy's head base, and you achieve that by having these summoned minions move over to the base and attack it, after having dealt with the minions summoned by the other player. The depth of the game is incredible from the outset; PoxNora has hundreds of cards in it, and just about every card has multiple different abilities to digest before deciding if it fits into your deck. Very few cards are truly useless, though many aren’t particularly good on their own. Conversely, it’s rare to have a card that’s truly good in isolation. Many (if not most) cards have abilities that are fundamentally better in combination with the abilities of other characters. In other words, building a good deck requires more than just putting the most powerful and expensive cards in. A good player will build a team of cards that all build on the strengths of one another, while hiding their weaknesses. A good player will be able to win games against a weak player, even if they’re using the standard deck that’s provided to players when they first start playing PoxNora, and the weaker player has spent a fortune to get all the good cards. Once you’ve got your deck sorted, it’s time to head into the game proper. There’s two ways to play. PoxNora has a very comprehensive series of single player games, broken down into dozens of “quests,” which will take weeks to work though by themselves. The AI isn’t great, but the game balances things in its favour by creating special conditions to contend with. For example, to summon characters onto the map, you need to pay a “fee” in mana, which steadily accumulates each turn. Powerful characters naturally cost a lot more mana. A mission might challenge players by allowing the AI able to summon certain characters for free, even as you have to pay normal price for them. Somehow surviving that flood long enough to get your powerful pieces on to the board and start to stem the tide is a genuine challenge. Ultimately these single player missions, challenging and interesting as they often are, are more to let you test out decks and strategies before heading into the online. PoxNora’s online lobby system is a bit archaic, much like the rest of the game, but once you get the swing of things, it’ll be hard to put the game down to play anything else. Because there are so many cards, and so many potential combinations, just about every player in PoxNora will have their own strategies and approaches to the game. Where in other games, such as Hearthstone, you’ll see many similar “builds” of decks showing up from one game to the next, in PoxNora the range of player strategies is far more comprehensive, and this results in a more dynamic strategy game. Just be aware that matches can drag out for hours. 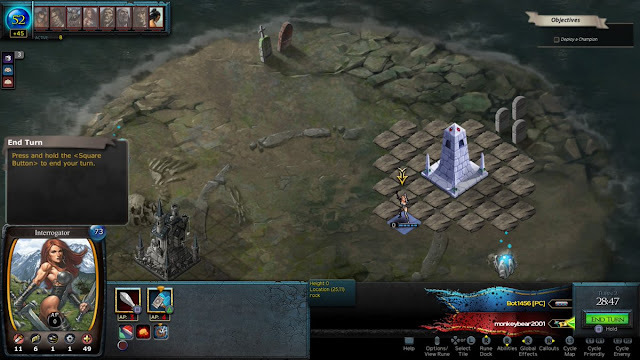 PoxNora is actually quite busy as turn based strategy games come – even once you’ve masted the interface in online multiplayer you are restricted in how long you can take with your turn, and once there’s more than a couple of figures on your side of the table you’ll struggle to be able to use them all in the time you have. Despite this, a well-balanced match can march on for hours. Veterans of tabletop wargames, board games, and RPGs will be used to this, but people more used to the pacing of standard videogames will find the adjustment difficult. Ultimately, it’s a game that’s worth supporting with some cash anyway, because it’s the kind of game that can turn into a hobby all by itself if you want it to. Putting aside the age of the game, PoxNora really is a fusion of Warhammer and Magic: The Gathering, and it’s a game that has been sustained by a loyal community for so long for a really good reason; It’s brilliant.